Setting up a repeating carpool is just like creating a regular ride. The only difference is that you will invite another family in addition to selecting your rider(s) and toggle "repeat this ride" on. Start by opening the website and clicking the "Schedule a Ride" button. You'll then be asked if you would like to book a ride for "Just my family" or "My family + our carpool". Select "My family + our carpool". 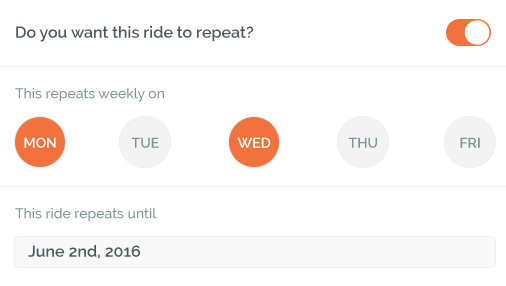 After you select "My family + our carpool" you’ll see the calendar where you can pick the date of your ride. Be sure the correct date is highlighted in orange. You can scroll the hour and minute to set the time of your ride. Be sure you’ve selected the correct time of day, AM or PM. Then click the blue "Next" button. You’ll be prompted to select your riders. You can choose up to 3 of your own riders. Click here to learn how to add a rider. After you've selected your riders you can either select an existing carpool family or add a new one. 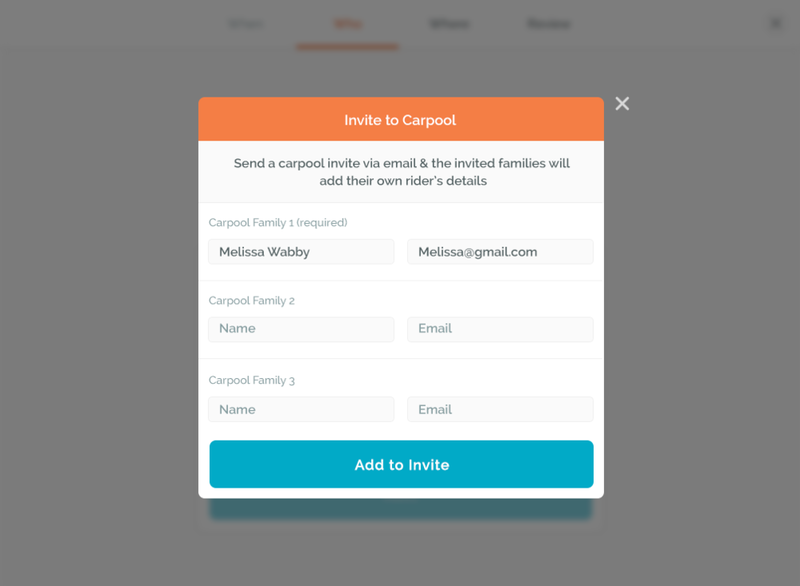 If you click on choose to add a carpool family you'll be able to add carpool families using their name and email. When you've added all of the participating carpool families click "Add to invite". After you've selected your riders and added carpool families to your carpool you'll be able to select if the riders will all be picked up together, dropped off together, or picked up and dropped off together. Complete the rest of your ride setup as usual. Keep in mind that the carpool family will add their own rider's details. Invites will be sent after you schedule the ride. When you get to the review screen toggle "Repeat this ride" on, select the days you would like it to repeat and set the end date. Your invitee's will receive an email with a link to join your carpool. 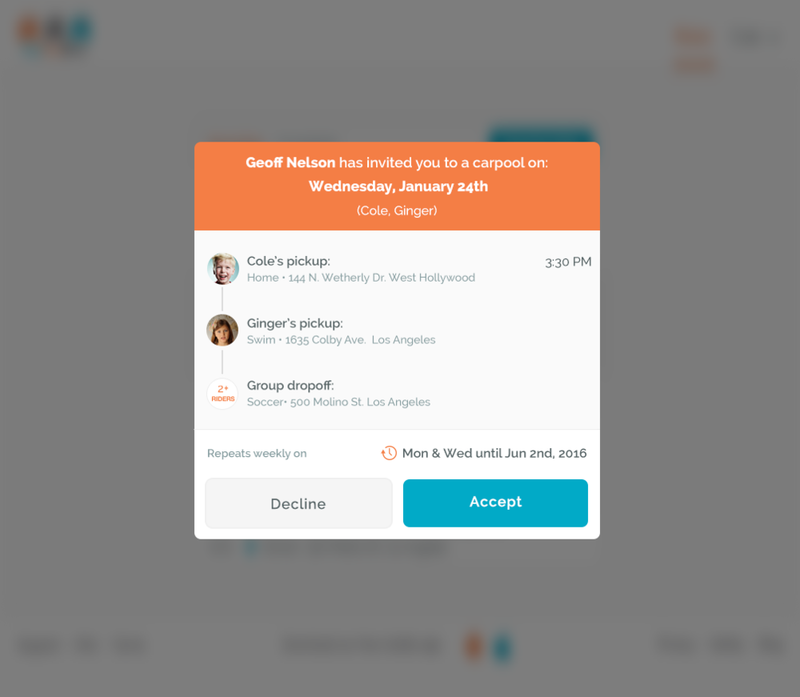 If they have an account setup, the carpool invite will be the first thing they see. If they haven't used HopSkipDrive before, all they have to do is setup an account and they will then see the invitation. Once they accept the ride, they can select the riders they want to participate and the pickup/drop off location (if it differs from the other riders). When all of your invitees accept or deny your invitation you'll be notified through text message.